Don't you love it when you go to the grocery store and your 3-year old picks up a bag of brussels sprouts and puts it into your cart? Yeah, that actually happened this week! He wanted me to make them for him and I was literally speechless (which is hard to do)! It felt like a mom-win moment! 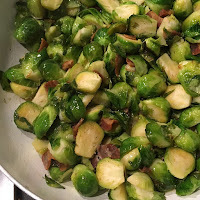 A while back, my husband wanted brussels sprouts to go along with dinner. The problem was, at that point, I had never had them prepared in a way that I enjoyed them. It was one of those foods that I knew was good for my body and so I would force some down once in a while, but that was as far as it went. Since my hubby had specifically requested them, I was determined to figure out a way to really enjoy them, especially since they were going to be the main vegetable served with dinner that night. After browsing the web for some inspiration, this simple and super yummy recipe is what I came up with. If you are also a brussels sprouts skeptic, you have got to try this one out! My 2-year old loved them too! Your mind will be blown away by how easy, yet delicious they are! 1. Cut the bacon into small pieces and then cook on medium heat in a frying pan until almost fully crispy. 2. Add the butter and onion and cook until translucent (about 5 minutes). 3. Add remaining ingredients and cook, stirring occasionally, until the brussels sprouts can be easily punctured with a fork (about 10 minutes). If they are browning too quickly, turn the heat down a little bit. 4. Serve these babies up with your protein of choice and enjoy!